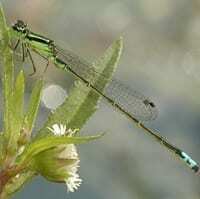 Eastern forktail is a member of the damselfly family Coenagrionidae. The males are yellow-green with blue on the top of the eighth and ninth abdominal segments. The females may be orange, or less commonly yellow-green like the male.